Starburst - All time Best Slot by NetEnt. Play Now! Starburst is an exciting Net Entertainment (NetEnt) slot with a classic slot theme. Loaded with icons of gemstones, it can deliver a luxury gaming experience. Players can win some incredible prizes thanks to bonus features such as re-spins, stacked wilds, and expanding wilds. Playing Starburst slot is very easy as the game is based on standard slots rules. Players need to first place a bet and then spin the reels. If a winning combination of symbols appears on the reels, they will win payouts. If not, they can place another bet and try again. The slot comes with 10 paylines and players can activate as many or as few of them as they wish. The game allows them to bet up to 10 coins per active payline, choose from a coin value range of $0.01 to $1.00. The betting range for Starburst is therefore $0.01 to $100.00, which makes it an ideal slot for high-stakes as well as low-stakes players. Like all NetEnt slots, Starburst also comes with a Skill Stop Feature, which transforms it into a game of skill for players who like to control the outcomes of their games. 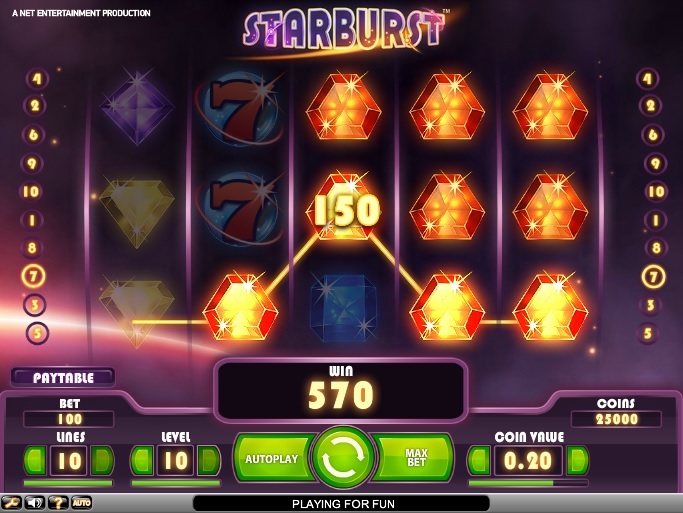 NetEnt’s Starburst has the looks of a classic online slot, but the features of a modern sophisticated slot. The graphics are incredibly brilliant, the sound effects realistic, and the animations entertaining. The slot is capable of making players feel rich with its symbols of yellow gemstones, green gemstones, orange gemstones, blue gemstones, and purple gemstones. There are also symbols of bars and sevens to remind players of classic slots. In case of NetEnt’s Starburst slot, all the symbols on the reels can appear in the form of stacks of up to three each. Stacked symbols are popular because they increase players’ chances of completing winning combinations and grabbing prizes. The wild symbol in case of Starburst slot is the Starburst symbol. It appears only on the second, third, and fourth reels, but can expand all over them. If Starburst wild symbols appear on the second, third, and fourth reels, the re-spin feature gets activated. Players will get one re-spin if at least one Starburst symbol appears on the second, third, or fourth reels. When this happens, the Starburst wild expands all over the reels and freezes in position for one re-spin. If players get another Starburst symbol during a re-spin, they will get another re-spin up to a maximum of three re-spins. Players’ chances of winning big prizes are greatly increased during the re-spin feature. Starburst is one of the most popular slots at NetEnt casinos. In fact, several NetEnt casinos give away free spins on Starburst as new player bonuses. With its re-spins, expanding wilds, and stacked wilds, Starburst presents several opportunities to plump one’s bankroll.